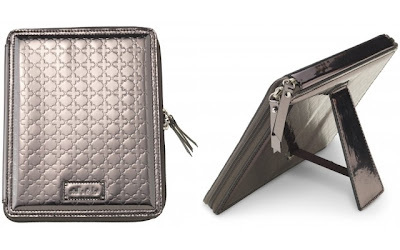 If Santa would be nice enough to bring me an iPad this year, then I hope that he would throw in this Embossed Metallic iPad Case from Stella & Dot. There are so many options for iPad cases out there, but this is the one for me! I love the metallic pewter color, the embossed pattern, and, most of all, the sleek-looking easel stand on the back. This iPad case retails for $79. Santa can afford it, right? Well, Santa will be happy to know that, for every $50 you spend, you will earn $25 in Dot Dollars to redeem for yourself in the new year. This is a great way to get gifts for friends and family while also shopping for yourself. You can apply the $25 Dot Dollars for every $50 you spend between Jan. 3rd-10th, 2013. Don't worry about forgetting your Dot Dollars because on January 3rd you'll receive an e-mail with your Dot Dollar promo codes and each code will represent a $25 Dot Dollars award.